President-elect Donald Trump is leaning towards choosing Rex Tillerson as his nominee for secretary of state, according to multiple news reports this weekend. NPR has not independently confirmed those reports. The potential pick is already drawing scrutiny for the ExxonMobil CEO’s close relationship with Russian President Vladimir Putin. Though he has no government experience, the 64-year-old Tillerson oversees a company that has operations in 50 countries around the world and has worked closely with Putin. In 2011, he struck a deal with a Kremlin-controlled oil company to drill in the Arctic, but the project was put on hold after the U.S. and Europe imposed sanctions on Russia over its actions in Ukraine, according to the Wall Street Journal. 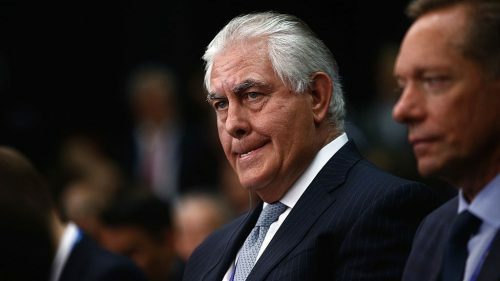 Tillerson has opposed U.S. sanctions against Russia, telling his company’s shareholders in May 2014 that “we don’t find them to be effective unless they are very well implemented comprehensively and that’s a very hard thing to do,” according to NBC News. The prospect of Tillerson as secretary of state sparked a round of criticism from Democrats, and even pushback from Republican senators who would vote on his nomination. Trump and his transition team insist that no final decision has been made and that an announcement is coming this week. Trump praised many of the candidates he has interviewed for the job in an interview on Fox News Sunday, where he was asked to make the case for Tillerson. “He’s much more than a business executive. I mean, he’s a world class player,” Trump said of the ExxonMobil chief. The news of Tillerson’s likely nomination comes just as the CIA has concluded that Russia intervened in the 2016 election specifically to help Trump win. Trump pushed back on that report late Friday, in a statement that disparaged the CIA but didn’t address Russia’s involvement. Throughout the campaign, Trump repeatedly praised Putin and questioned earlier reports from the CIA that Russian hackers were behind the release of emails from the Democratic National Committee. Trump’s deliberation over who should serve as the country’s chief diplomat has been very public. In an interview process that has seemed at times to mirror the drama that the former reality TV star loves, other finalists for the job included Senate Foreign Relations Committee Chairman Bob Corker, R-Tenn.; former CIA Director David Petraeus; and 2012 GOP presidential nominee Mitt Romney, a leading critic of Trump in the 2016 campaign. Romney recanted his comments calling Trump a “phony” and a “fraud” as he lobbied for the secretary of state job. Former U.S. Ambassador to the United Nations John Bolton was also seen in contention, but reports indicate he is likely to be named as deputy secretary of state, responsible for daily operations as the State Department. Another onetime top pick, former New York City Mayor Rudy Giuliani, announced Friday he had taken himself out of the running, though earlier reports had indicated it was Trump who had already decided that one of his most fervent supporters and frequent surrogates would not get the plum post. If Tillerson is nominated, there will be some tough questions ahead about how he can take on the role of America’s top diplomat and distance himself from his company’s interests and his vast holdings of Exxon shares, which are reportedly worth about $151 million. There are some breaks between Tillerson and the president-elect. According to The Hill, Tillerson does believe in man-made climate change and supports the Paris climate agreement that Trump opposes. Tillerson is a Texas native and has run ExxonMobil since 2006. He began his career at Exxon as an engineer in 1975. Michele Kelemen, Meg Anderson and Arnie Seipel contributed. This entry was posted in KRTS News and tagged Election 2016, ExxonMobil, President-elect Trump, Secretary of State, Trump Administration, Trump Cabinet, Trump Transition. Bookmark the permalink.